Based on the author’s wide-ranging experience as a robot user, supplier and consultant, Implementation of Robot Systems will enable you to approach the use of robots in your plant or facility armed with the right knowledge base and awareness of critical factors to take into account. 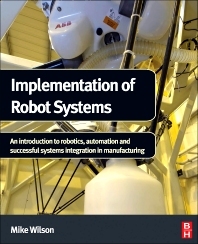 This book starts with the basics of typical applications and robot capabilities before covering all stages of successful robot integration. Potential problems and pitfalls are flagged and worked through so that you can learn from others’ mistakes and plan proactively with possible issues in mind. Taking in content from the author’s graduate level teaching of automation and robotics for engineering in business and his consultancy as part of a UK Government program to help companies advance their technologies and practices in the area, Implementation of Robot Systems blends technical information with critical financial and business considerations to help you stay ahead of the competition. Engineers and managers across all industries involved in manufacturing, robotics and automation, including manufacturing engineers, plant engineers and project engineers. Engineering students preparing for roles in manufacturing, robotics and automation. Mike Wilson is president of the British Automation and Robotics Association (BARA), director of the Processing & Packaging Machinery Association (PPMA), vice chairman of the Engineering and Machinery Alliance (EAMA) and former chairman of the International Federation of Robotics (IFR). Mike has a 30 year career working with robots as a user, supplier and advisor. He is an experienced automation consultant, working throughout Europe, North America and India across a variety of industries as managing director of Creative Automation Solutions Ltd.